I just wanted to say THANK YOU! for the most practical advice on how to sound natural I've gotten yet! Between paid courses and free online help, I was getting really frustrated that, no matter what I was doing, I just couldn't stop sounding like I was reading! Your article Advanced Cold Reading Techniques just changed my entire delivery in five minutes. I'm dumbfounded! Don't read the word you're saying— it's so simple a change, but it makes such an amazing difference. I have a lot to practice and again, thank you for the tips on strengthening that technique. I see that you offer one free class, and I hope to hit that up sometime in the upcoming months. I am very interested in seeing what kind of formal education you guys offer as I delve deeper into VO. I purchased 11 VO downloads from your website last week, and I'm on my fourth listen of your online segments. I am thoroughly enjoying them and, more importantly, I'm learning from them. I'm seriously interested in doing voice-overs, and I've been researching all aspects of the VO business---genres, overall market, technique, classes & instructors, equipment, etc---for the past three months. 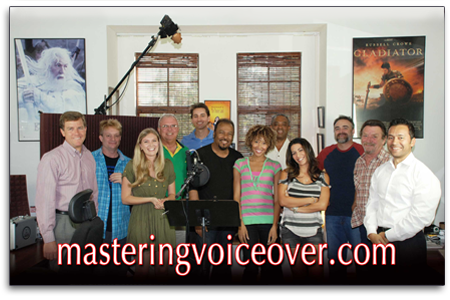 I must tell you I've come across many VO vendors and classes and instructors on the Web, and you have by far the most accessible teaching method and style of anyone I've encountered during my research. For some reason, your humble and efficient instructional style resonates with me. much like what you did with the General Finance copy. Dan, please let me know if you have any VO course material in this or other format that would allow me to go deep in practicing technique. Many thanks for reading my email, and thanks for giving back to those who would like to follow in your steps. I ordered my "Mastering the Art of Voiceovers" course a few month ago. I finished it quickly working on everything you provided me with in the course. I practiced a couple months and finally finished my demo. Thank you for your awesome course its helped me get on the right track on my v/o career path. Here I send you my demos they are pretty much the same except one is in English and the other in Spanish. 13 years of radio never taught me what you did in 4 hours and thats a fact. I wanted some time to write and tell how really pleased I was with your persdonal coaching and your home study course. As a full time voiceover professional, people judge me by my voice, not only when I am “in the studio" but also when I first meet them in person or on the phone. As with any business there is that time period as you work towards the goal of having that person become your client. Your instruction and examples gave me a whole new insight into sales and success, and a whole new dimension of being able to control my voice. I was once told by a very successful friend that the road to success is not about drastic changes, it is about learning all the time and making minor adjustments in the way that you do things. The way you presented the material was just about making some miner subtle changes to the way one uses ones voice. I have made changes based on what I learned in the course. I was at first a little hesitant to write how great I thought your course was, Because as you know I work in a VERY competive industry and I wanted to keep the information to myself… your information has already had apositive impact on the way that I use my voice with my clients and potential clients. Just wanted to drop you a note of thanks for selling me those CDs. I have hadincredible improvement this year thanks to the exercises on Disk 3. Now, I feelmy chest, teeth and lips vibrate when I'm speaking, so I think something ishappening right!! Verizon's got me doing regional commercial work and I tookon imaging work for three radio stations. It has not been without its setbacks, which I expected at some point. I now have a crack in the lower register of my voice. I never had a clue how deep my voice really was, as itdeveloped, I noticed a specific range in pitch where it just "dropped" down tothe lower pitches, I haven't earned the control or real ability to slur down tothose same pitches yet, but I'm working through it and will have it undercontrol soon enough… that and the trailer growl ala Howard Parker!At any rate, thanks again for all your time putting together the study at homecourse. Here's to a Happy New Year! My demo is great. i keep listening to it over and over like afreak. my friends can't believe it's me. i can't wait to get my websiteup. i'll be back again eventually to take another round of classes, butuntil then I'll be working on marketing (myself)! A bunch of people have mentioned that my strongest voices are theyouthful, animated ones. thanks againfor putting together such a masterfully rad demo! All I can say is WOW. You helped me reach such an amazing level, and there it is on the voiceover demo you did for me. Thank you so much for everything and how much you care. I couldn't believe how much you Home Study course on CD helped me. The breathing techniques changed my life. Within two months I got parts in two new films and I know our work helped me a lot. This stuff is the best and nobody teaches it like you do. My demo is VERY impressive! I've received very impressive feedback from the few qualified people that have listened to it… great music selection and excellent editing! I've even turned in a favor to have somebody design a CD label for me that could ultimately be part of a corporate ID design including business cards and letterhead, etc. I'll definitely pass it by your way for your comment before I send it out the door. I wanted to thank you again for a fabulous one day workshop at The Commercial Clinic two Saturday's ago. It was a great experience and I really enjoyed your teaching style. I would love the opportunity to work with you again as I begin the process of preparing for my demo. Could you please send me information on private coaching and your demo production services? I am presently starting another 8 week class with Jim and Penny (partly because they had to cancel a few of the last session..and just for more practice!) and I am also starting to gather copy for use on my demo. Thanks again for your encouraging words - I look forward to hearing from you! Thank you for including me in your Tuesday class last week. It was great to hear your voice in person after all this time hearing you on CD. I’ll keep working on that technical copy. Thank you for the great direction. Thanks again for the workshop Saturday morning.I picked up a lot of information just in that short time period! I’ll be out of town for the rest of April, but will stay in touch re: future classes.